Enmanuel De Jesus was promoted to the Salem Red Sox the team announced yesterday. The 6-foot-3 lefty had dominated for Greenville over 23 innings to start the year with a 2.35 ERA, 0.87 WHIP, and an impressive 31 strikeouts to only 5 walks. In his last appearance for Greenville, he was excellent allowing only 1 earned run over 6 innings with 10 strikeouts. However, his first start for Salem last night did not go quite as well, giving up 8 runs, 12 hits, and 2 walks over 4 1/3 innings. The 2018 draft is approaching quickly, taking place June 4th to 6th. Over the Monster took a look back to the Red Sox 2014 draft which looks very solid in retrospect, landing them Michael Chavis, Michael Kopech, and Sam Travis among others. Over the Monster also recapped the far less successful 2013 draft, 2015 draft highlighted by Andrew Benintendi, and 2016 draft which features three players currently ranked in the top 10 on the SoxProspects.com rankings. The latest mock draft from Bleacher Report has the Red Sox selecting Canadian catcher Noah Naylor with the 26th pick. They note he has plus power and should stay behind the plate defensively (far from the industry consensus), but he has been rumored to go anywhere from the middle of the first round to out of the first round altogether. ESPN's Keith Law updated his 2018 MLB Draft Big Board today and he has Naylor as the 14th best prospect. If you really want to know who the Red Sox are likely to pick, you should be eagerly awaiting SoxProspects.com Editor-in-Chief Mike Andrew's draft preview. There he will detail potential picks for the Red Sox throughout all three days of the draft. 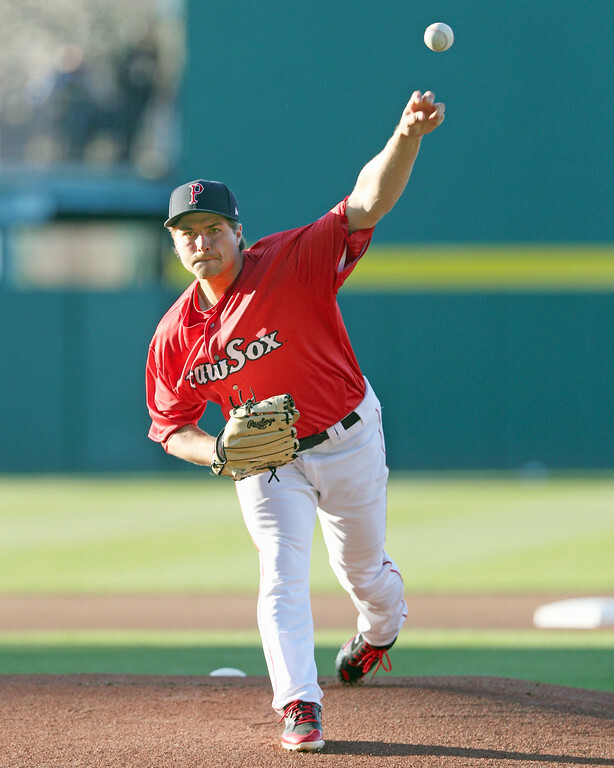 SoxProspects.com Senior Staff Writer James Dunne pointed out on Twitter that Pawtucket lefty Jalen Beeks is currently lined up with Red Sox left-hander Drew Pomeranz who has struggled this year (28 2/3 innings, 5.97 ERA, and 1.78 WHIP). While that might be a bit presumptive, it just goes to show how impressive Beeks has been this year. Over 43 1/3 innings over 8 starts, he has a 2.28 ERA, 0.99 WHIP, and 65 strikeouts to 10 walks. On Monday, he gave up 4 runs (3 earned) over 6 innings with 6 strikeouts without walking a batter. Amazingly that was arguably his worst start of the season and the only time he has given up more than 2 earned runs in any starts. If this type of dominance continues for the 24-year-old, it will be very hard to keep him out of the big league rotation. Others have been taking notice of Beeks' performance as well. MLB Pipeline wrote about 5 Al East prospects to watch, and the Red Sox player featured is Beeks. Similar to Dunne, they also could see Beeks up soon noting that his ETA is "as soon as this season. If the Red Sox have an injury in the rotation, Beeks could be the next man up." ESPN's Eric Longenhagen also listed prospects for all 30 teams to watch in 2018, and unsurprisingly he listed Beeks for the Red Sox. He writes, "Beeks has pretty good stuff but has long been considered a reliever by most of the scouting community. He has improved his control enough now that he's a viable No. 4 starter prospect." Brewers righty and former Red Sox prospect Josh Pennington injured his pitching arm and has retired as the Milwaukee Journal Sentinel's Todd Rosiak notes on Twitter. Pennington was part of the package along with Travis Shaw and Mauricio Dubon that the got the Red Sox Tyler Thornburg in 2016. This trade has been tough for the majority of players in the deal with Mauricio Dubon out for the year after tearing his ACL and Thornberg yet to pitch for the Sox Sox. Photo Credit: Enmanuel De Jesus and Jalen Beeks by Kelly O'Connor.